My grandfather has a few rules that go unquestioned and are universally obeyed. One of them is "leave it better than you found it." It could mean the bedroom I'm staying in at their home...or the kitchen after I eat lunch. It also applies to borrowing tools, the car, the tractor, or anything else that does not belong to me. Leave (or return) it better than you found it. A profoundly simple rule to remind us to respect others and their property. Somewhere along the line, such respect for others and their property has been diminished--and all but forgotten. So it turns out my Grandad's rule of leaving things better than you find them is more universal than I thought. Just for fun, I researched the origins of the idea, and almost everyone attributes the notion to Robert Baden-Powell, the father of the World Scouting Movement (in the US it became The Boy Scouts of America). A lightbulb went off in my head when I saw that. See, I am an Eagle Scout, and looking back I now realize how important that axiom is. Everything we did in Scouts reflected the idea of respect for others and their property. After all, a Scout is trustworthy, loyal, helpful, friendly, courteous, kind, obedient, cheerful, thrifty, brave, clean and reverent. So perhaps the reason we have no problem following Grandad's rule is because almost all of us went through the Boy Scouts. Both of my grandfathers were Eagle Scouts. My father and uncles were too. My brother and most of my cousins are also Eagle Scouts. To me, these values seem so obvious because I grew up surrounded by them. We have only one reputation in this world, and when it gets damaged, it takes an extraordinary amount of effort to repair it. In business, any successful businessperson knows that long term reputation matters more than short term profit. And with that said, here are some things we can all do to improve our reputations and leave things better than the way we found them. 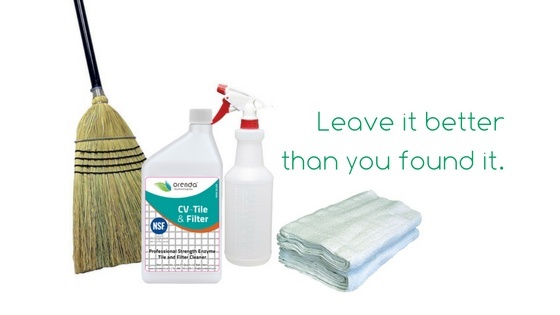 Clean beyond your own mess. Hopefully you already clean up after your work. But do you go the extra mile and wipe down something you did not touch? With swimming pools, almost everywhere I go I see dirty filters, pumps, and other equipment. Dust is everywhere and it doesn't look good. Let's say you're there to replace a pump motor. How much time and effort would it take to wipe down the pipes with some cleaning fluid and make them look nice for the customer? Take before and after photos. Sometimes a customer may not notice what you have done. So share with them the gratification of a job well done. Show them the improvement so they can appreciate the good work you have done for them. Ask customers about the little things. What bugs your customer? Is there something else you can do to make their life or job a little easier? I have a perfect example of this. In my rental home we had a plumber come to fix a leaking pipe in our bathroom. We did not have the tools nor the experience to find the leak, let alone fix it. When the plumber finished the job (in under an hour) he asked if we had anything else he could do. My roommate said their faucet had a slow dripping leak. Without question, the plumber went in there with his tools and fixed the problem in seconds. No charge, no nonsense. We tipped the guy and left a glowing five star review on Google for him. He left our house better than he found it. Nearly every time I visit a commercial pool pump room, or a homeowner's back yard, I instinctively look for little things to clean. Pieces of trash, dead leaves, dirty equipment, etc. It does not go unnoticed, and I strongly recommend investing in pack of cleaning rags, some cleaning solution (and actually, CV-600 and CV-Tile & Filter work great as cleaning agents too) and a broom. Those three items, if used, may prove to be the most valuable tools in your truck for your reputation and growing your business.